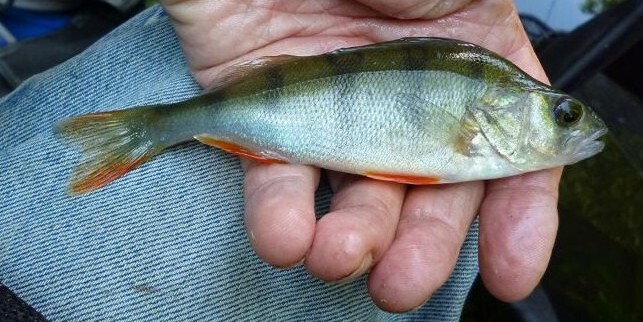 Perch dominate on the Middy Stick. 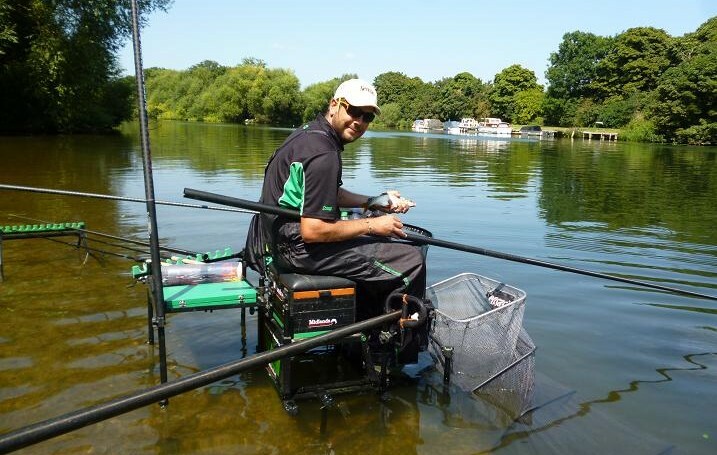 I am fortunate to live in an area offering a wide range of fishing, the problem being where next? 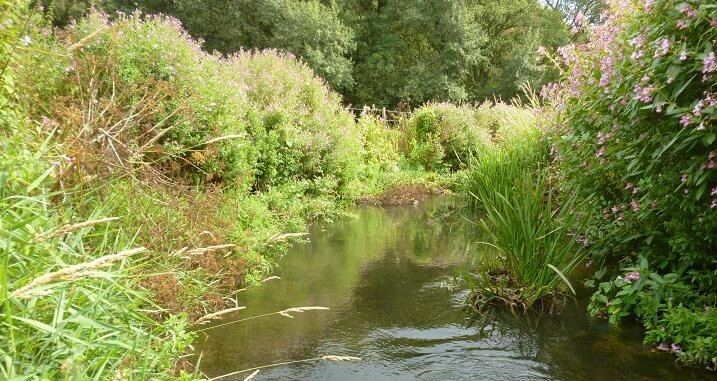 When a planned trip to Berkshire’s River Kennet fell through at the last minute, I was baited up for a fast flowing river, but with nowhere to go. Not for long. Under ten miles from my home is a river, which, like many in England, was a victim of the country’s industrial past, with mills driving machinery, while the water was used throughout it’s length to carry away waste products. Later on with the advent of the motor car, it’s flood plain was scavenged for gravel to tarmac roads, while the remaining holes became sites for landfill, or filled with water to provide more fishing. 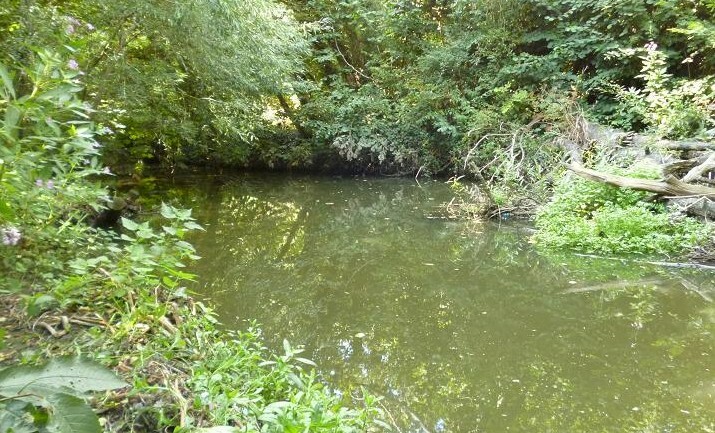 Today the river runs clear and fast through a ribbon of green, towards the River Thames, the industrial estates and housing are still there, but masked by trees. This swim is typical of the hard fish river, the banks are worn and the trees opposite are festooned with floats and broken lines, the fence on the far side hides an automated industrial process plant, that rattles and grinds away 24/7. The attraction is that there are plenty of fish here, my only other visit being an autumn day three years before, when only equipped with bread as bait, I filled my net with roach and chub. 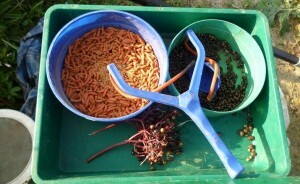 Today I had hempseed and red maggots, being interested to see what the change in bait would bring. 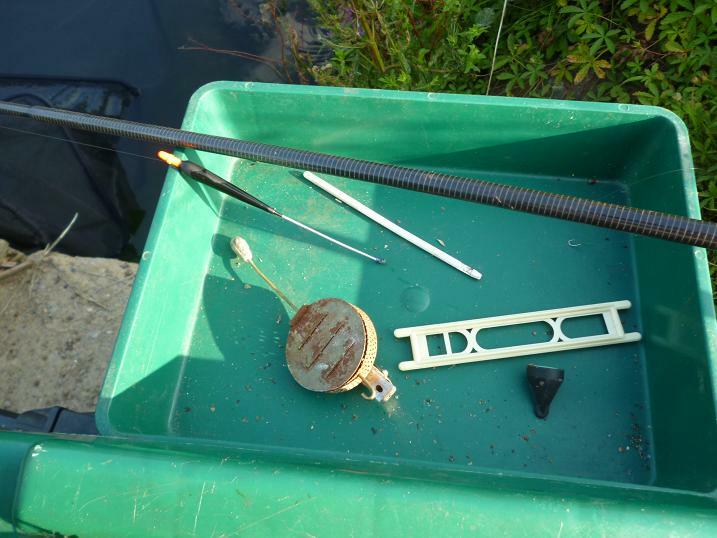 I set up my Hardy 12 ft soft action match rod, with it’s companion ABU 501 closed face reel, to control a 3 No 4 Middy ali stemmed stick float, putting a single red maggot on a size 16 hook. On my arrival I’d seeded the swim with a couple of handfuls each of maggots and hemp, not being surprised when on the first trot down the middle, the float dipped, then sank slowly out of sight. The rod bent into a deep bodied roach, that flashed in the morning sunlight, as it dashed around the swim. The net went out and I brought the rod back to slide the 8 oz red fin into it. The rod top snagged in the branched above me and I watched helplessly, as the roach danced half in and half out of the water, tangling the line in the leaves, before flicking off the barbless hook. One point down to the fish. Hooking the float with the landing net, I cut the line above it and pulled the rod line through. A two loop join and I was ready again, but not before moving a few yards up, away from the overhanging branches. 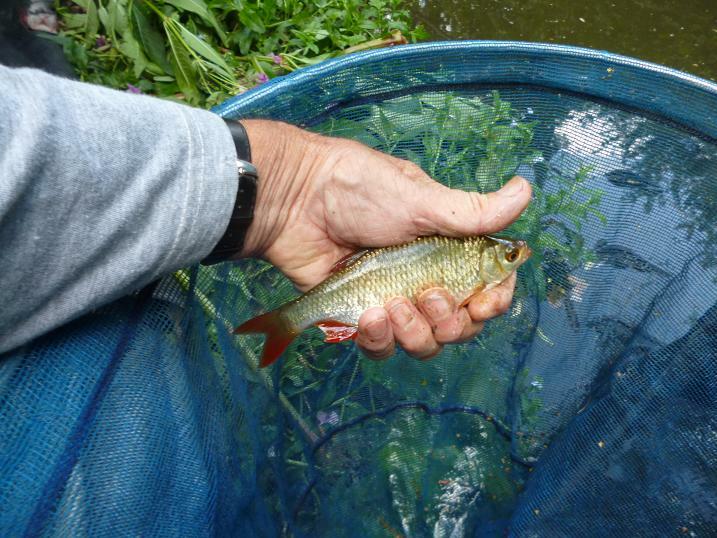 This then gave me another problem, the raft of weeds now in front, that would attract any fighting fish, as proved on the second cast, when a perch demonstrated how easy it was to dump the hook, when being brought through them. Two points to the fish. 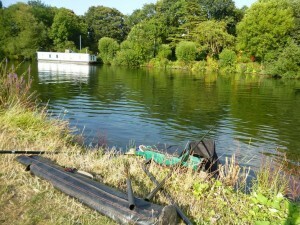 A compromise position was found, I would just have to be careful with the rod top, when netting a fish. Third trot and a smaller perch obliged and I decided to swing it in, only for the lip hooked fish to wriggle off and drop at my feet, bouncing back in before I could grab it. Three nil to the fish. Mental note: net all fish. The float dipped, then faded from view, a sideways strike to avoid the trees and I was into a solid fish that soon let me know that it meant business, running on the back wind toward the roots along the far side. 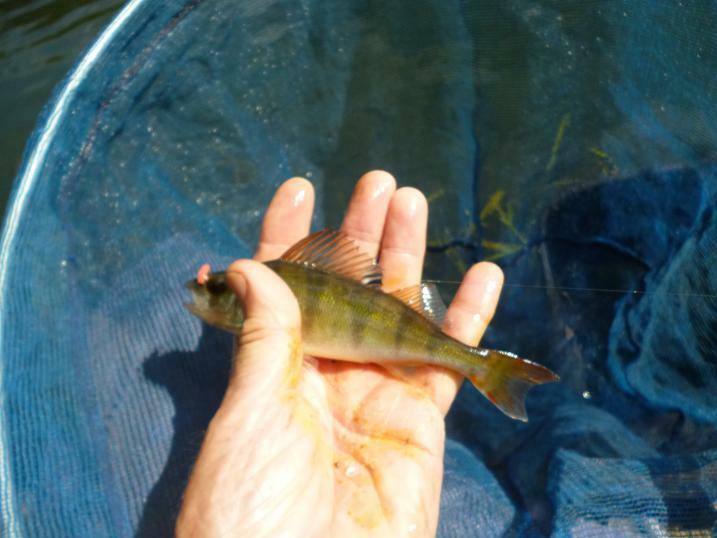 As I got the landing net ready, I heard myself say “don’t loose this fish”, playing a nice perch in the open water, before bringing it close to the enticing weeds, extending the net out over them to scoop it in. Phew! I don’t know what I would have done, if I’d lost this one. Maybe I take my fishing too seriously? Next trot down, I held the float back hard, it stopped and sank. The bouncing fight told me I had a second chance at landing a roach, it diving beneath the net and into the weeds, but surfacing long enough to net it. Like the perch, the hook dropped out in the net. 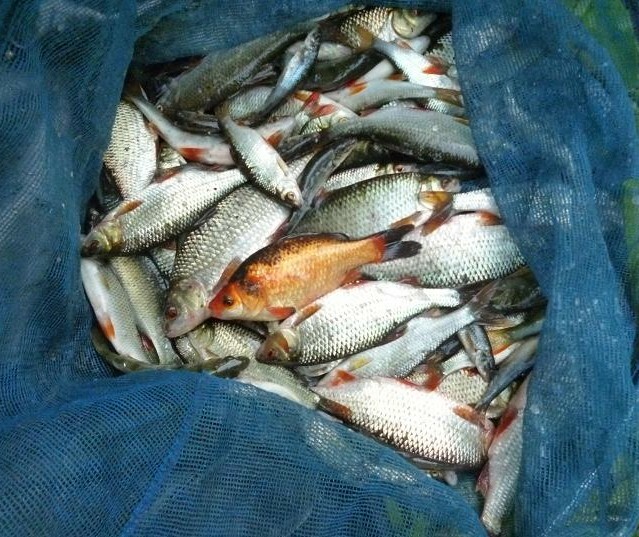 I was beginning to relax now; two quality fish in the net and plenty of bites. Another half an hour and the middle line was exhausted, a few lightly hooked perch, that came off before the net not helping. 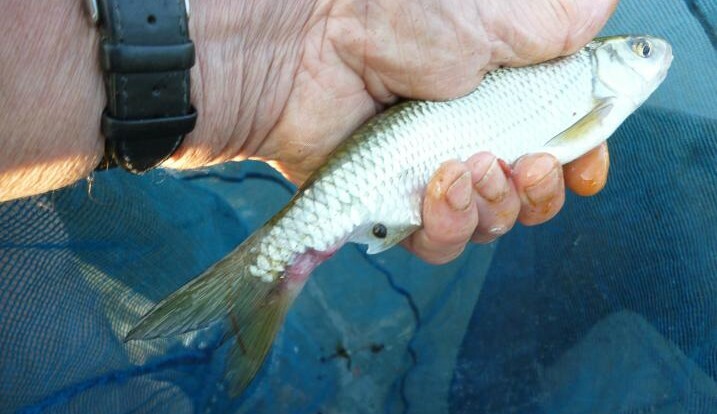 I’d been feeding hemp with maggots over to the far bank and first trot down at the same depth, the float shot away, with the line following, the initial rod bending strike pointing to a decent fish, but the line eased and small chub came to hand. 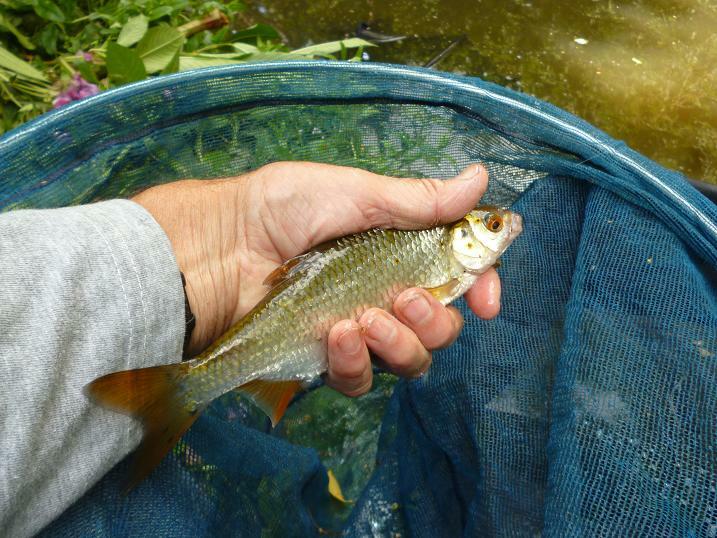 More small chub followed, many too small to keep in the net, but I kept feeding heavily in the hope of a better fish, but with none showing, a change was required. There was a steady upstream wind, that allowed the float to be inched down the swim and with the stick set overdepth, eased the maggot down a against the flow. The next bite, buried with what I thought was another perch, but instead a big gudgeon, spewing maggots, was pulling like a good ‘un, I even netted it. I missed the next few bites, sharp dives of the float. Still feeding hemp, fish were hitting the shot, a No 4 going completely. I pulled the strung out shot into a bulk and hit a dace immediately, only for it to be taken by a pike, as it struggled. 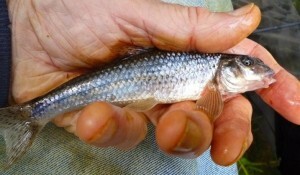 The pike let go, then came back and took the stricken dace again on the surface. A new hook link needed. Another trot, held back hard and a good roach was on, fighting all over the river, going for those weeds again, but successfully netted. 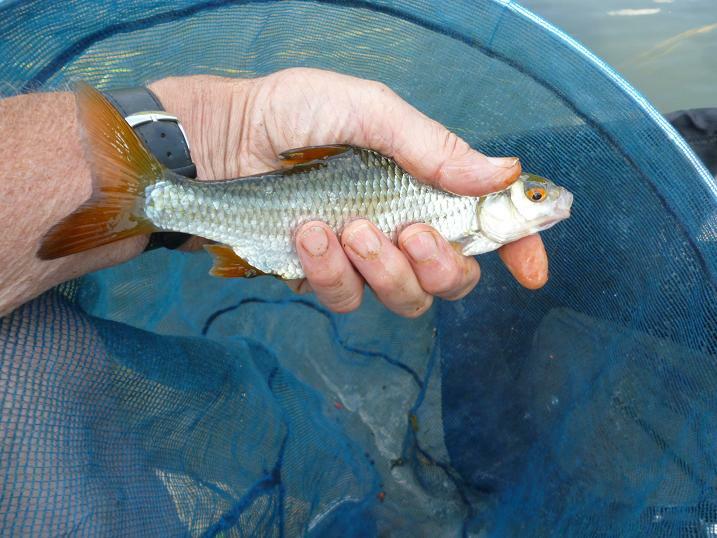 No apologies for a picture of another roach, this one a fin perfect 6 oz fish. Next cast, held back at the same spot, the float sank away and an even better roach was battling towards the weeds, this one making it and snagging the hook, but staying on. 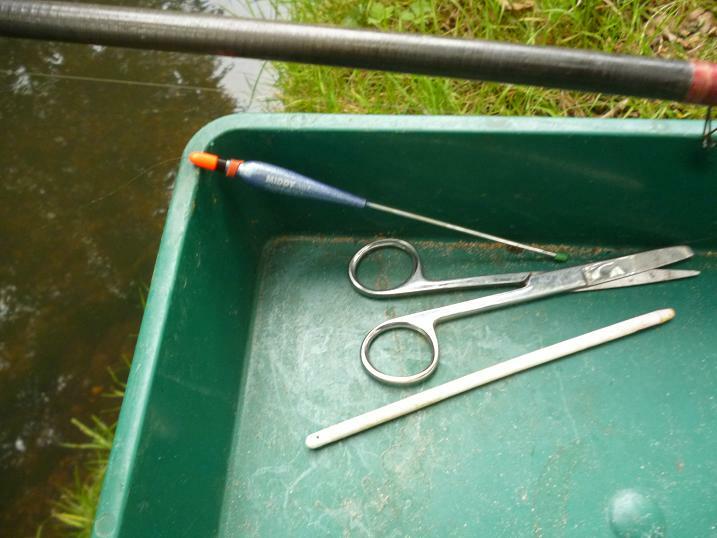 I could just reach it with the landing net and lift it, but the hook remained in the weed stem, pulling the roach back over the rim of the net. Needless to say, this was another fish lost and a new hook link again. This was not the easiest of swims to fish, having also snagged the overhead branches, when netting fish, a few more times, each one requiring the line to be cut. 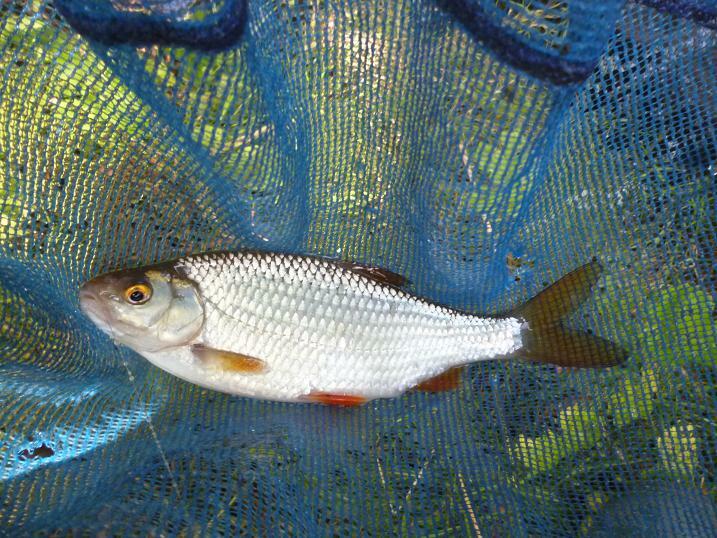 The bait was presented again, and another 8 oz roach hooked, then lost in my haste to get it over the weeds. That was the last roach I saw. Trotting further down, another good dace took, taken in turn by the pike before it cleared the bottom. I had the pike on for a few minutes, seeing that it was only about 2 lb, but when I pressured it, the hook came out of the dace. 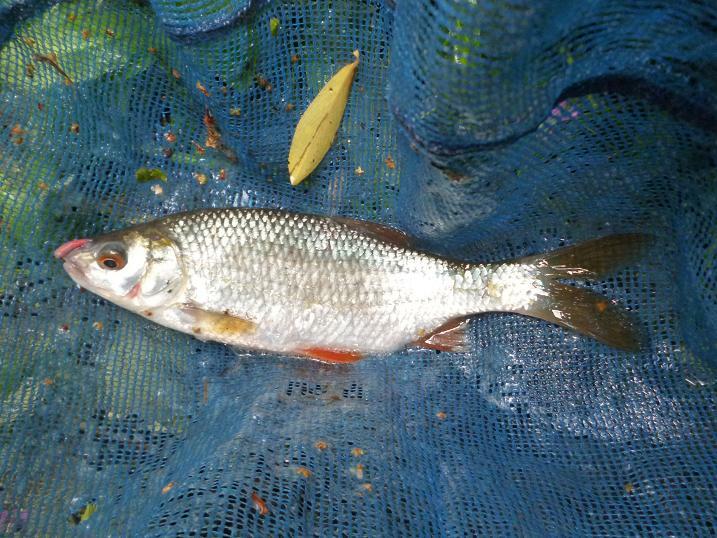 No doubt, while the pike was still munching on it’s prize, I managed another dace. 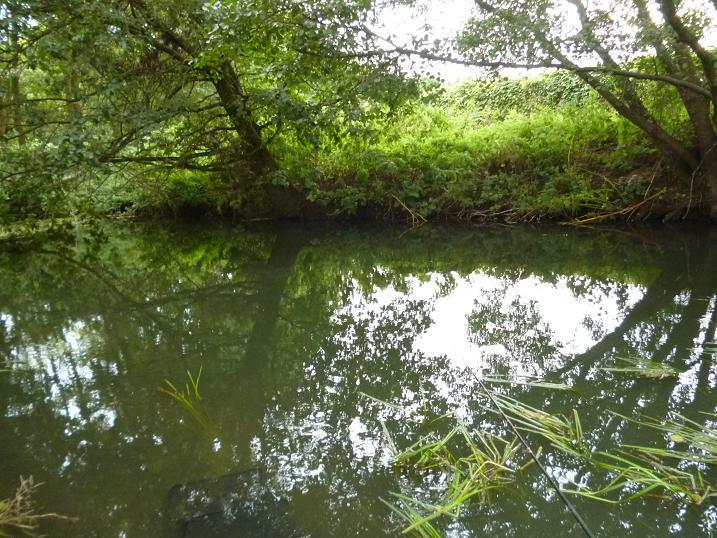 I shallowed up again and allowed the float to run in towards the overhanging tree along the far side, pulling the bottom shot up to give a foot of free line in the hope of a bigger chub, but saw only more small chub and the occasional perch. Deepening up again, the float would dip, but not go under, when it reached the branches trailing in the water. Something was interested, but not taking, so I tried pulling the float back a foot, then letting it go again. Bingo! The float sank away and a nice perch was on. The pike was now taking the perch, something I’ve not experienced before. Each time the perch was released, resulting in a panic stricken fish, some landed, others lost. The pike ignored the small chub that I retrieved slowly across the surface, it just wanted the stripeys. 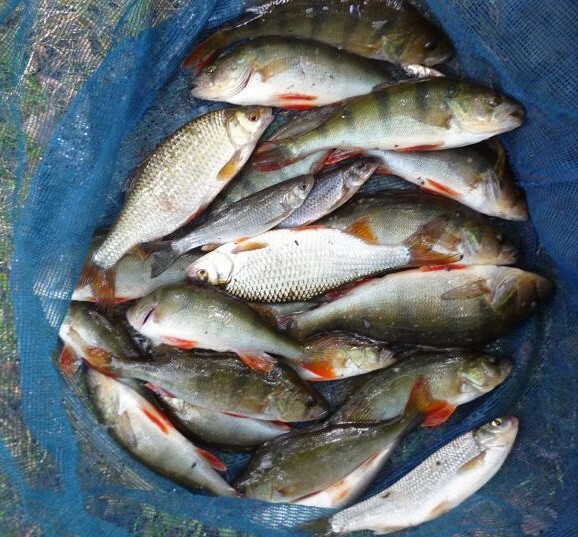 The final hour was spent teasing these perch to take, until I think they were all in my net, or like the roach had thought wiser of taking my maggots. 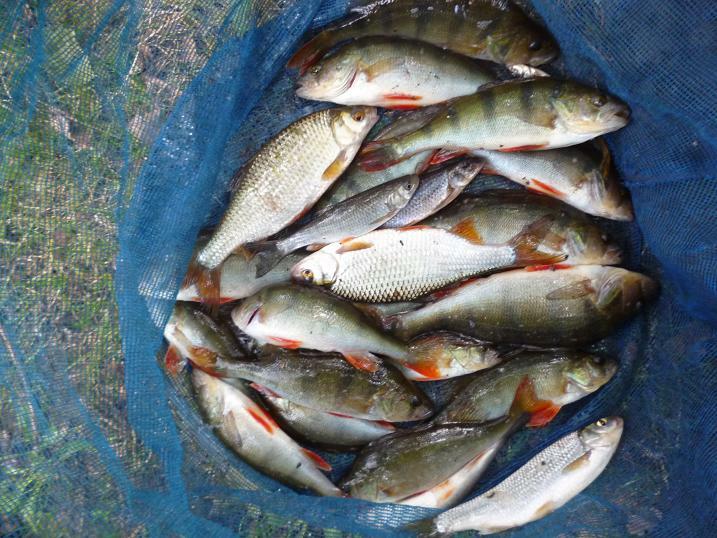 Some came off, as most were very lightly hooked in the tip of their lips, but by end of the morning session, I had around twenty in my net, plus the bonus roach, for over 7 lb of fish. I may return on a blackberrying visit soon, bringing along my pole saw for a bit of tree trimming. 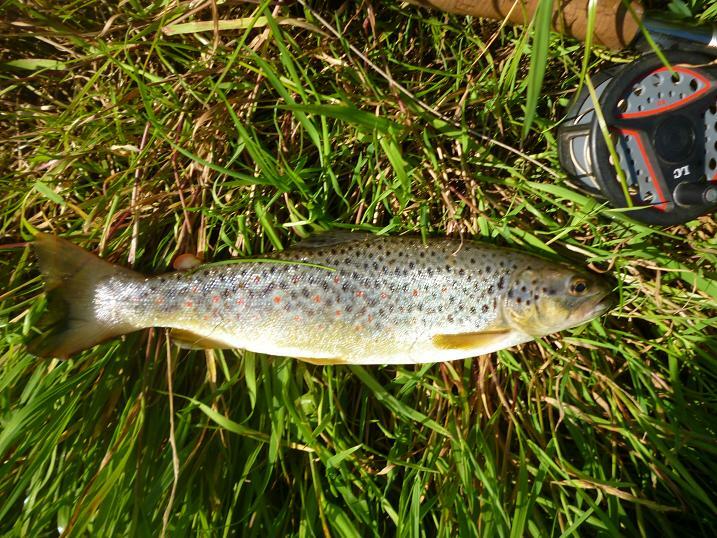 Wild brown trout few and far between on the summer river. 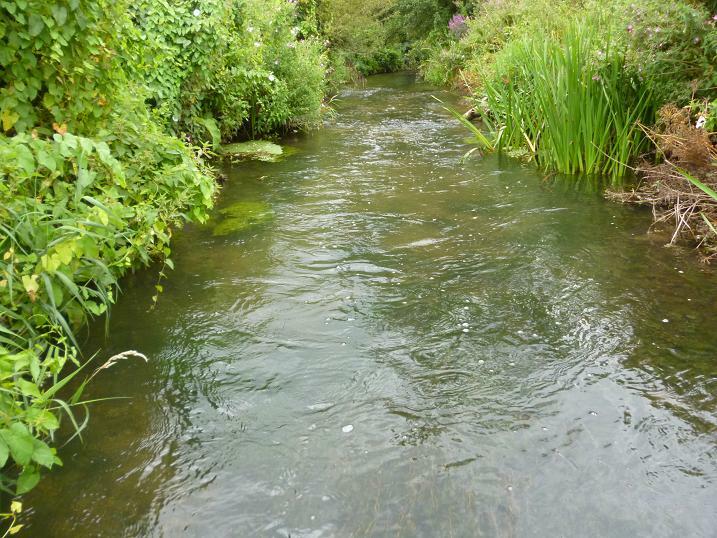 Weeks of bright sunshine, interspersed with heavy thundery showers, had kept me away from my small Hampshire trout river, and with more heavy showers forecast for the afternoon, I drove the ten miles from my home to arrive before 11 am, detirmined to catch a trout, or two. Walking from the gate down to the river, the corn had been cut and the hay bales were awaiting collection, life on a farm never standing still and it was clear from the well trodden banks, that fellow syndicate members had been busy too. 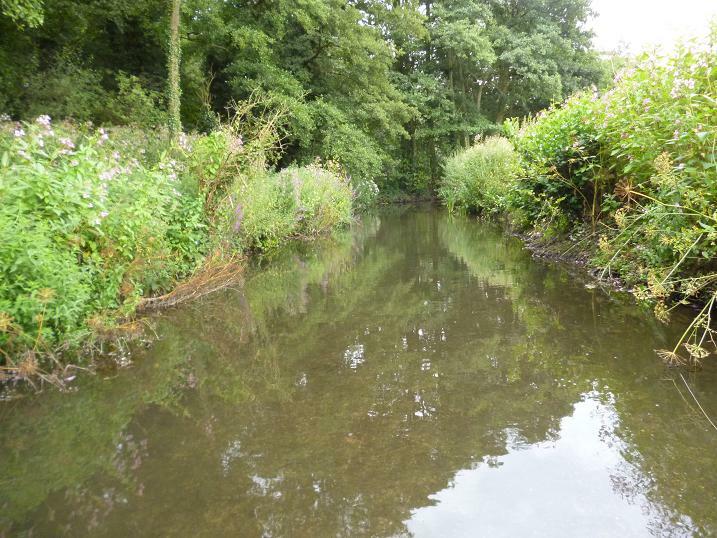 Ignoring these hard fished areas, I made my way down to a beat unknown to me and judging by the untroubled vegetation along the banks, not visited by anyone else so far this summer. 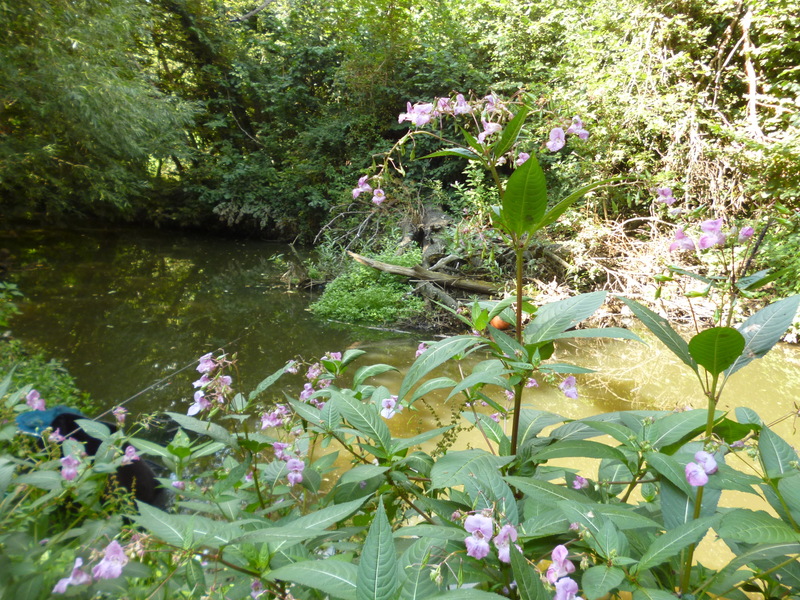 An overgrown tree barred further progress downstream and I parted ranks of himalayan balsham to lower myself down among reeds into the river. The reeds had grown out from each bank, leaving only a yard gap for the river to surge through and I was taken aback it’s force, the restriction pushing the water up to my waste. 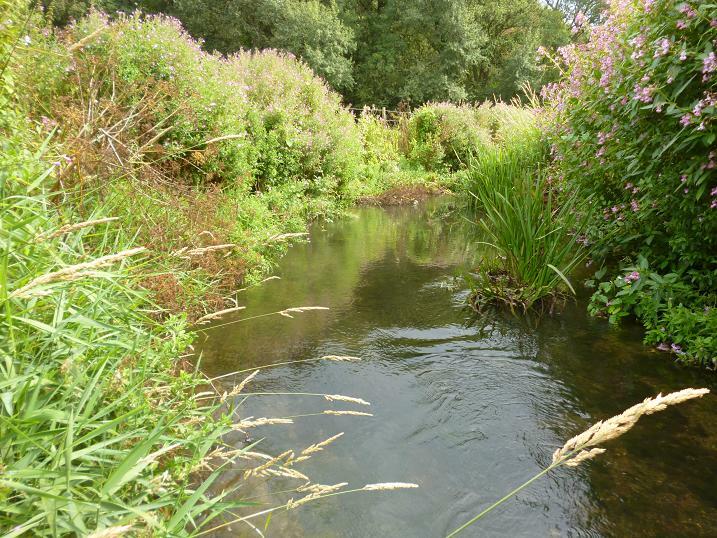 I was now committed to wade upstream, the banks here are too steep to climb out again and I used my landing net handle to test the depth, as I pushed through the reeds towards a clearing, that opened up in front of me. This looked so good, that I was tempted to take off the size 18 gold head Hares Ear and tie on a dry sedge, even though there were no fish rising, but it had already taken me almost an hour to get to this point and I was itching to fish this virgin territory. The nymph had barely touched the surface, when a fish swirled with a splash and straightened the line, boiling on the surface, as I stripped back to stay in contact. 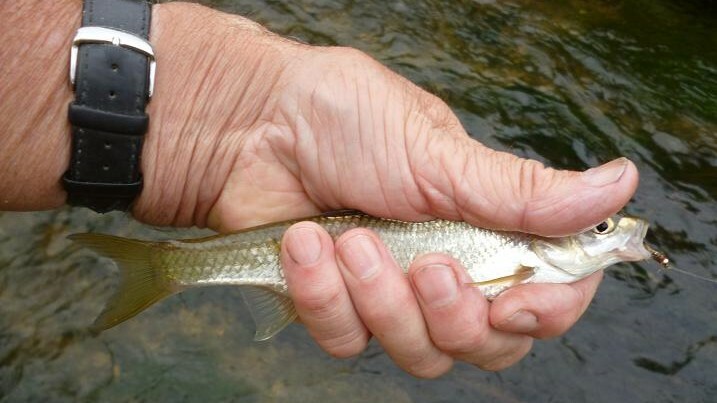 Not my expected trout, but a fighting fit dace, that continued the struggle in my hand. 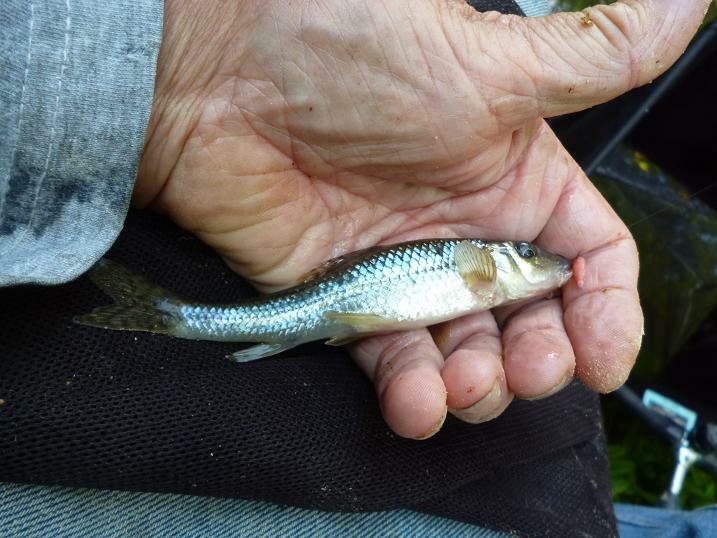 Another dace, then a small chub took with gusto. 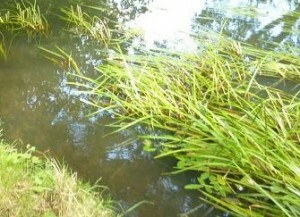 A longer cast dropped the nymph beneath a bankside shrub, it drifted alongside a clump of weed, then was engulfed, as a fish took. This was definitely a trout and a good one at that, diving back into the deep pool to it’s right, pulling hard against the rod, before breaking the surface in a shower of spray, then steaming past me into the reeds below, being carried by the strong current down towards the overhanging tree. The slack was taken up in seconds and the rod doubled over again. 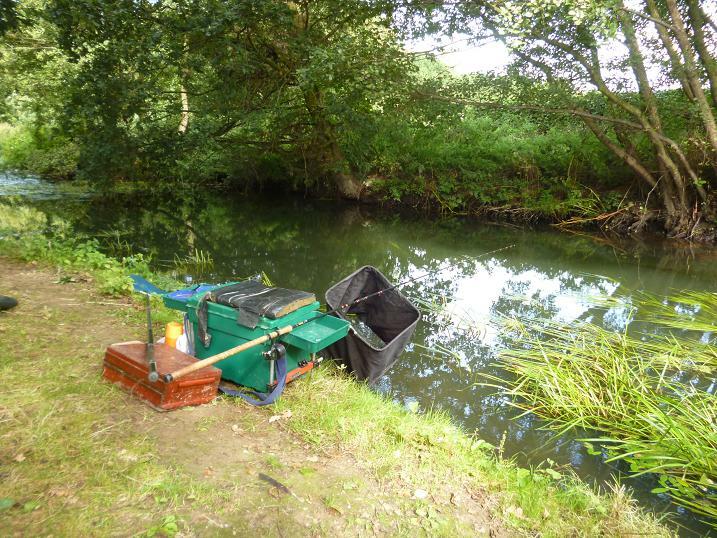 The trout was still on, hugging the bottom and taking line in surges, assisted by the flow. A bigger fish would have broken me, but this was under a pound and once turned, was fighting the funnel of water too, seeing a flash of gold, as it neared the surface, before diving again. Taking my time, I played it back on the reel, a pleasure for all flyfishermen, the wild brown on it’s side by the time it reached the net. A perfect jewel of the stream, from a dreamed of pool. 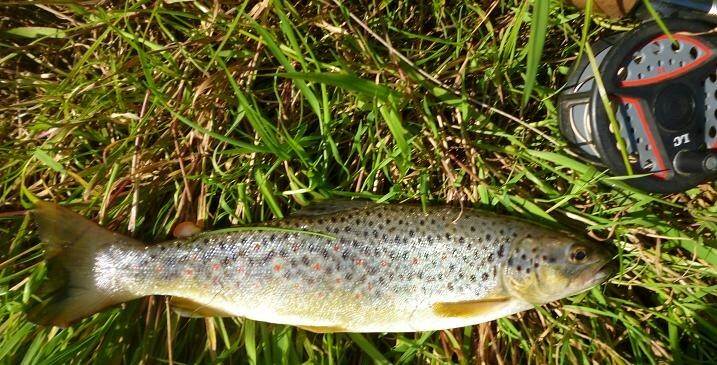 I have friends, who only fish heavily stocked lakes and rivers and expect a trout a cast, but for me this is the ultimate fishing, a true wild fish, hatched in the redds among my feet. The barbless hook had dropped out in the net and the trout stayed still long enough for a photo, before being released with it’s head upstream. I continued to wade, searching out the deeper runs, spooking a couple of smaller trout, that I failed to spot in time for a cast, but also tumbling another, that I did. A firm take resulted in a bustling fight from a tiny perch. 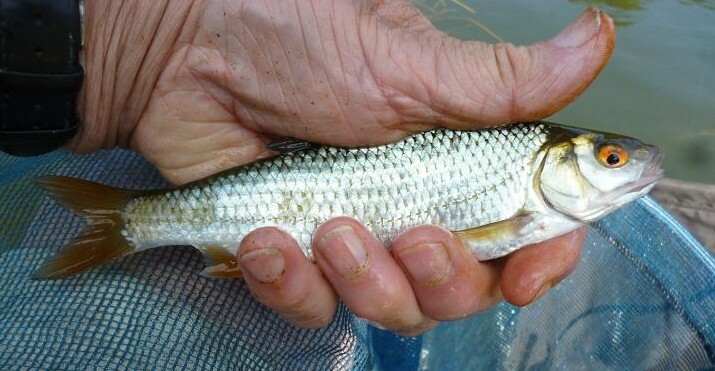 This equally tiny chub made a meal of the nymph. Clouds had been gathering and now the slow pitter-patter of rain falling on the foliage all around me, turned to a full blown hiss as the heavens opened, two hours earlier than forecast. I took cover under a tree, trying a few unrewarded bow and arrow casts, while I waited for the deluge to ease, then, once the rain dripping from the leaves was worse, than the rain outside, I ventured out. A deep run along the outside of a bend looked promising and casts were made as close to the overhanging greenery as I dared. I’m not sure what I saw first, the flash of gold, or the leader darting forward, but the result was the same, fish on. Smaller than the first brown, this one was almost luminous, it’s green-gold body clearly visible as it fought among the stones ahead of me. The forceps had to come out for this one, the nymph embedded in it’s tongue, the very reason I only use barbless hooks. A push back with the forceps and the hook was out, this beautiful trout swimming free, rather than lying dead on the bottom. 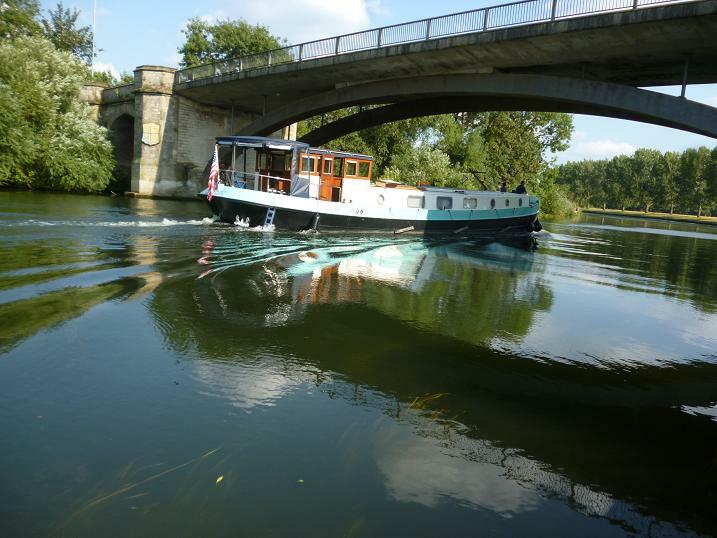 The rain stopped as suddenly as it had started and the warming sun came out again, bringing with it rises further upstream in calmer water. By the time I’d made my way up to the area and tied on a size 18 Deerhair Sedge, the rise had stopped. 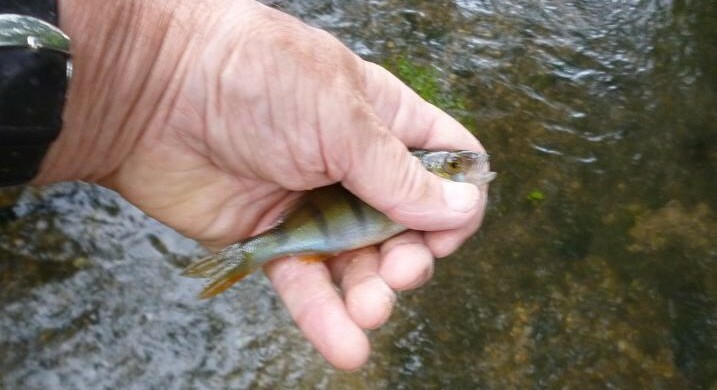 Knowing that fish were here and waiting for another hatch, I dropped the first cast above the tail of the pool, where a bold take made instant contact with a boiling dace, that was soon in my hand. 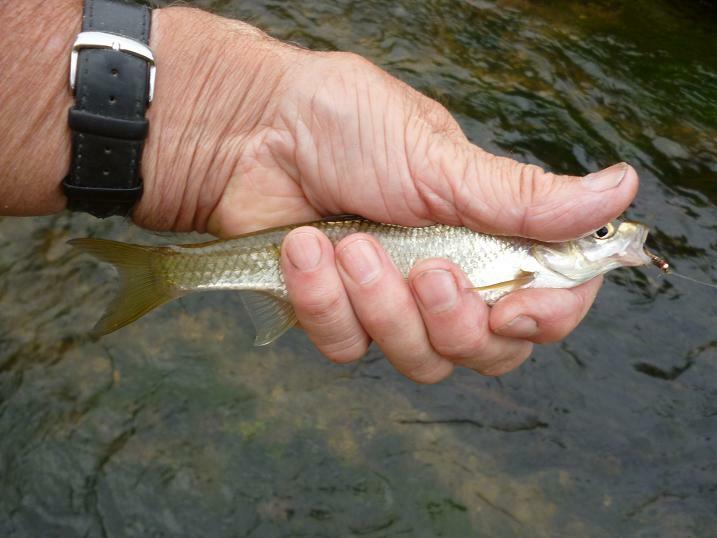 The dace released downstream, a cast further up into the pool gave the same result. Where were the trout? There were two decent browns in this pool earlier this year. I can only assume they have been caught so many times by other members, that they have cleared off. Maybe they were taken by mink, there have been reports of four killed in our traps recently. I continued my upstream wade into a previously prolific area without tempting a trout to rise, another small chub being my only consolation. Rain began to fall again and the nymph went back on, as I climbed out of the river to make for cover in a spinney, getting back in the river, when it eased. 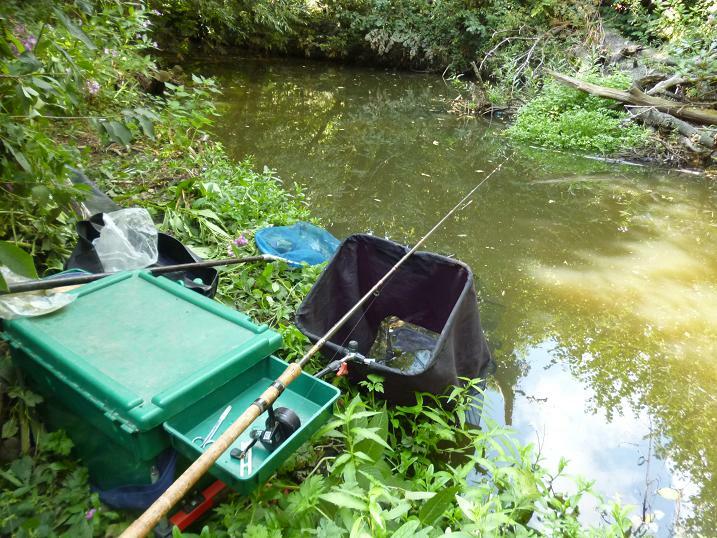 I’d made a few blind casts under the left bank, when I spotted a slight bulge beneath the surface to the right and dropped the nymph short to the spot. A take as it dimpled the surface, had a feisty ten inch brown scurrying around in front of me, as I frantically tried to retrieve slack line. It came off at my feet. At least there were some trout in this barren looking stretch. Further up a smaller brown tumbled off without setting the hook, this time from a pool, once protected by an alder, that fell victim to the farmer’s chainsaw this year. My final cast into a deeper run along the left bank, met with a snatching take from yet another dace, that had me hoping that it was a trout. A hard fighting fish, but not what I paid my money to catch. 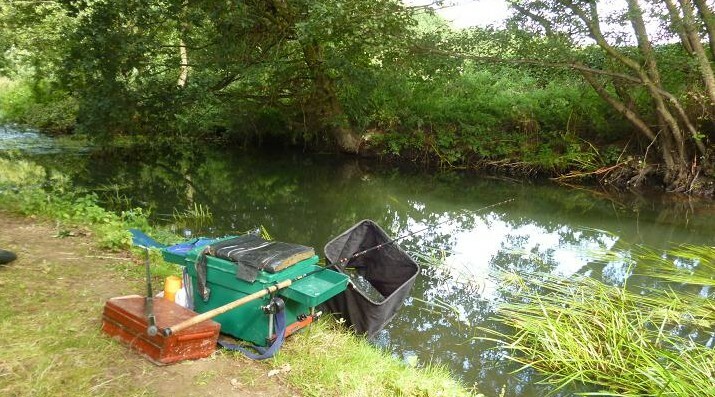 Signal crayfish and mink are both on the increase on our water, despite the best efforts of the voluntary bailiffs to reduce their numbers, which may be the reason for so few trout taken this session. 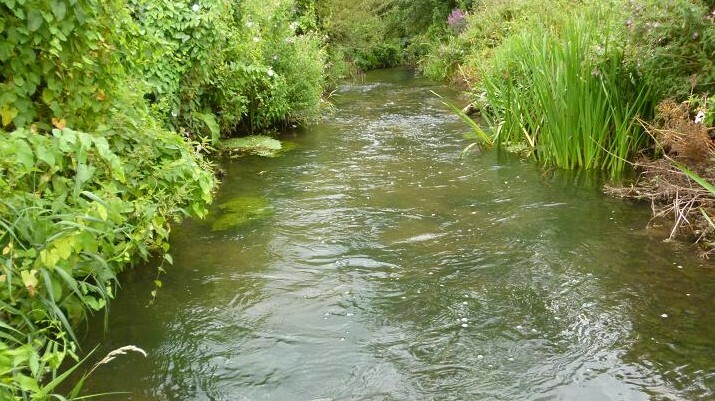 It had been hoped last year, that the rapid growth of the wild brown trout, would provide a bumper season, but that has not happened, the prime feeding areas being occupied by coarse fish. 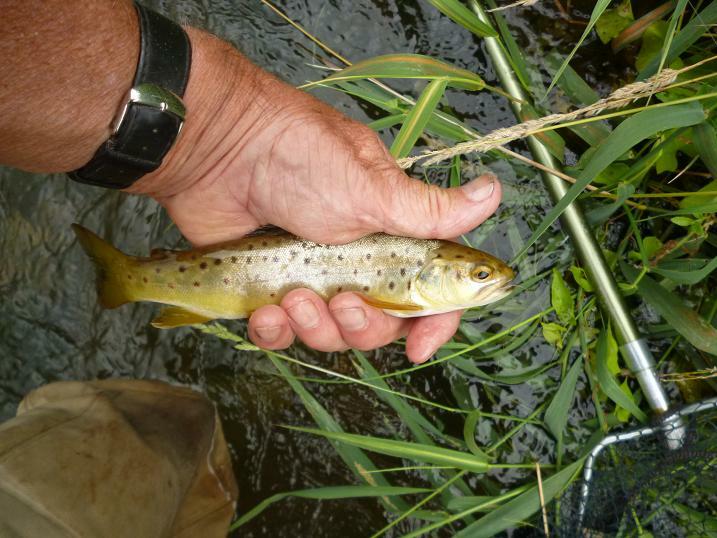 A rumble of thunder brought my visit to a close, I had still caught trout, had caught on nymph and dry, while fishing in the heart of the English countryside on a clear chalkstream, what had I to complain about? 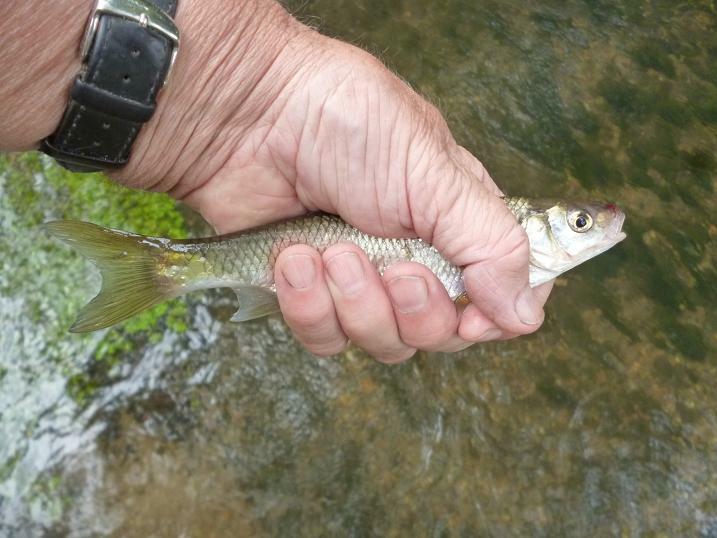 Small river stick float fishing, gets surprise results. 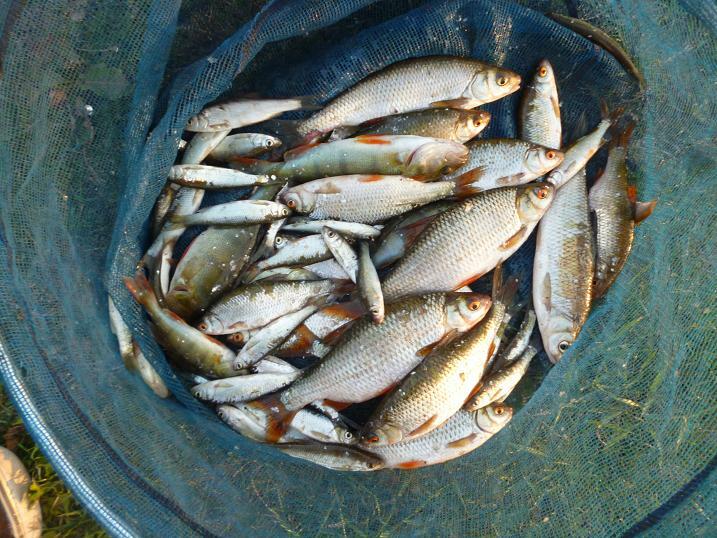 Too good to waste, maggots in the fridge and hemp in the freezer, bait left over from my previous session on the wide open spaces of the river Thames, were brought out for a visit to a tiny river, a couple of miles from home, a few days later. A change in the weather matched the difference in the venue, the long, hot days, had given way to thundery showers and sunny periods, bringing with them a drop in temperature. This was to be my first taste of summer fishing on this shallow, meandering water, which is formed, when two streams come together, one gaining in size as it makes it’s way across the fields, while the other acts as a drain to a large part of the town, only coming out into the daylight at the confluence of the two. 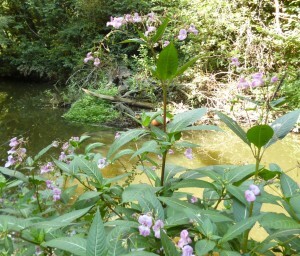 Never more than twenty feet wide and rarely over three feet deep, I’d only fished here in the winter with bread punch for the roach and chub, so this was like a new water to me, the bare banks were now transformed by six foot high himalayan balsam plants, this invasive species crowding out the slower growing natives. I’d made a beeline straight to my old winter roach swim, only to find the balsam barring my way, a thick jungle from the river to the raised pathway. 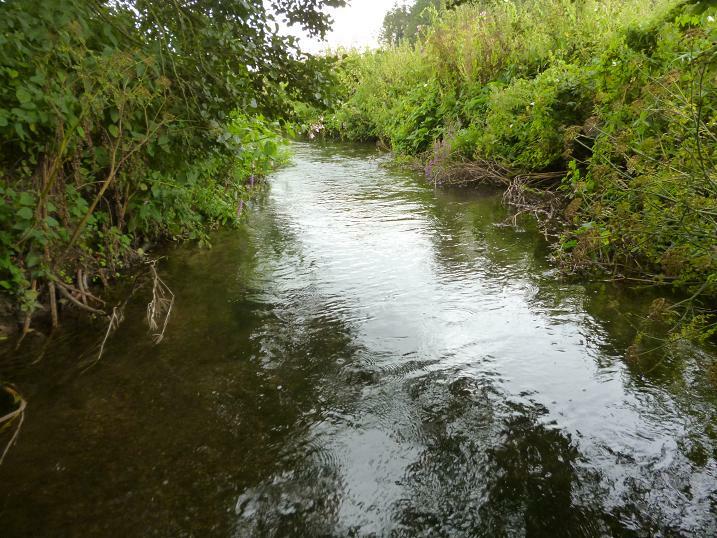 I continued down the path searching for a fishable swim, until I reached a spot where a bend passes close to the wooded banks and a narrow band of balsam occupied a thin strip of level bank. Opposite, a fallen tree had restricted the width, quickening the pace of the river. Perfect. Balsam is easily pulled up and I’d soon cleared a path through and placed my box just upstream of the fallen tree. 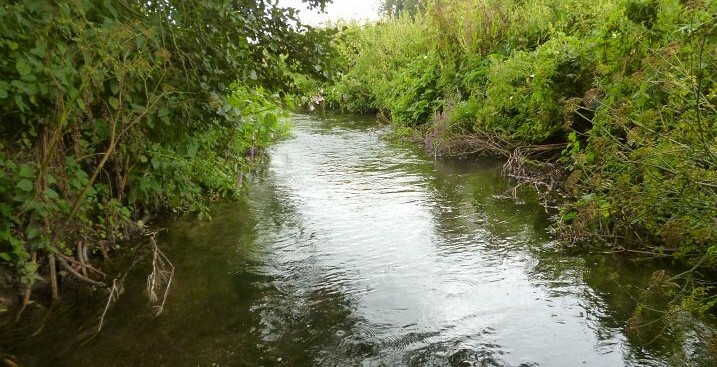 I’ve been fishing all my life, but there was something about this swim, that got me excited, the main flow pushing past the obstruction and directing it towards my bank and under overhanging trees, where a back eddy formed to run against the opposite side, lower down. 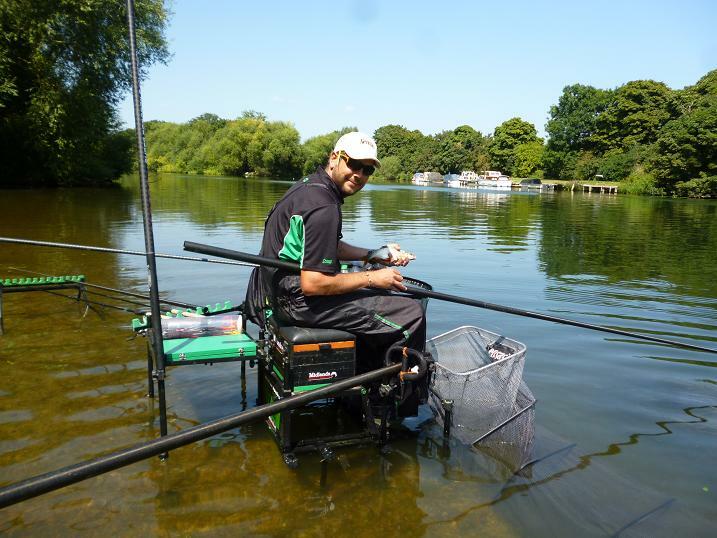 Many opportunities to catch the wide range of fish known to populate this water, which include carp, bream and chub. I was not being too ambitious today, just looking forward to a few hours watching the float going under, until I ran out of bait. With my soft actioned, 12 foot Hardy rod, balanced by a closed face ABU 501, I was ready for anything. I plumbed the depth and set the 3 No 4 Middy ali stick a few inches deeper, with the main shot bulked under the float, plus 2 x No 6 shot down the line. While tackling up, I’d prebaited a few handfuls of hemp, followed by some red maggots and my first cast saw the float dip and slide away as it tracked down the middle of the swim. 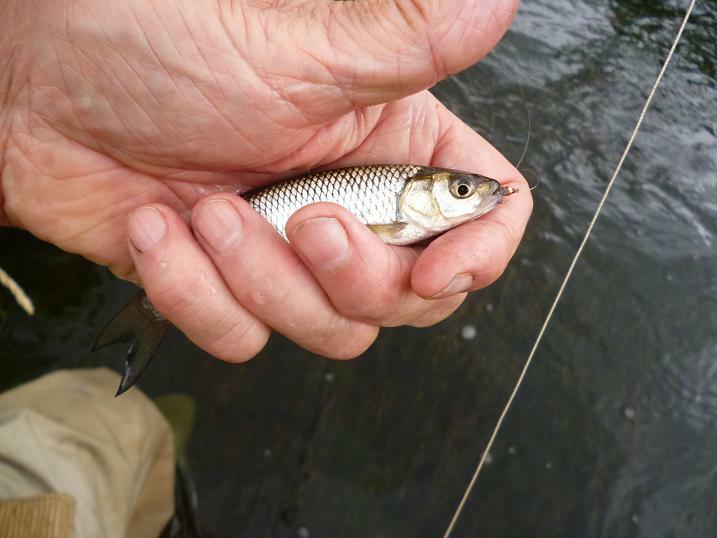 The rod bent into good fish on the strike, the dull flash of a roach showing through the coloured water, as it reacted to the hook, fighting hard in the fast water and swimming upstream along the opposite bank. A lift of the rod and it swam across to my waiting net. 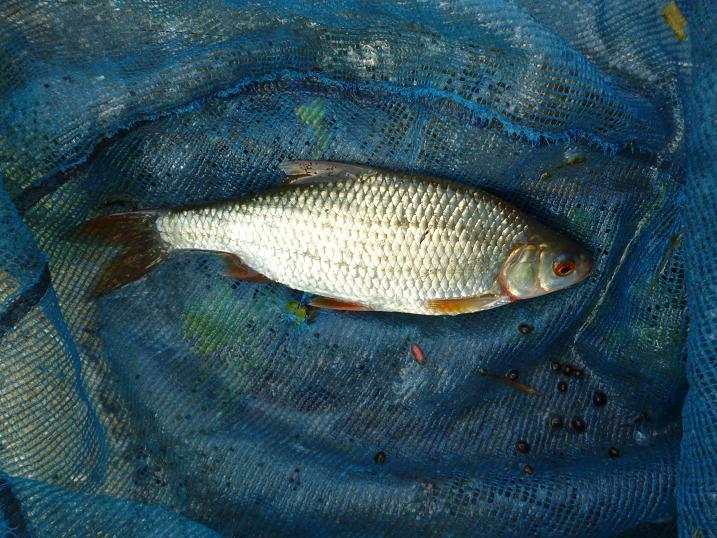 A fin perfect roach, that demonstrates the quality of fish available from this urban environment in a public park, with a busy road buzzing with traffic, only yards away on the other side of the river. With the hook rebaited and a few grains of hemp fed in, the float sped away again and a hard fighting gudgeon put an initial bend in the rod. 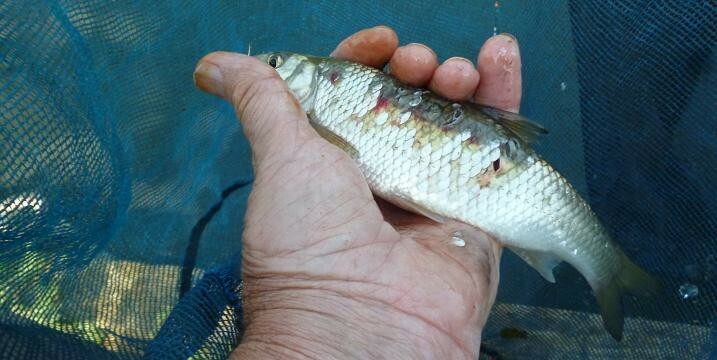 This was bad news, these clonking little fighters can take over a swim, when after bigger quarry, so only fed hemp for the next few cast, although it didn’t stop the gudgeon queueing up. 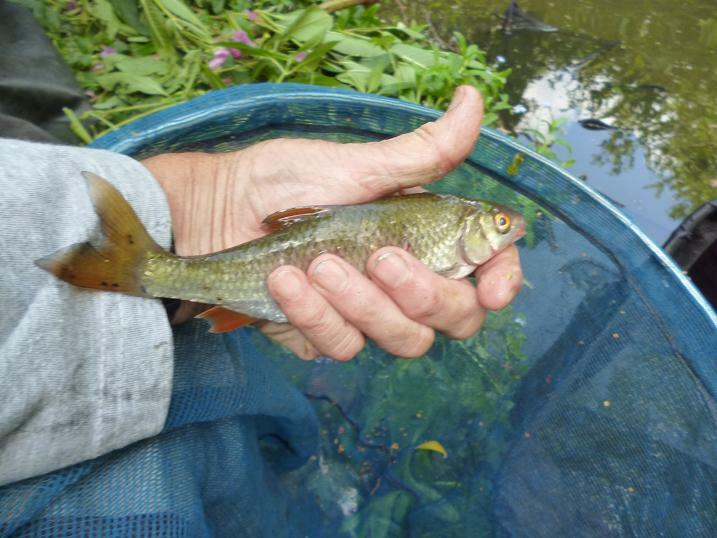 Then a different fish again, as a succession of rudd moved onto the feed. 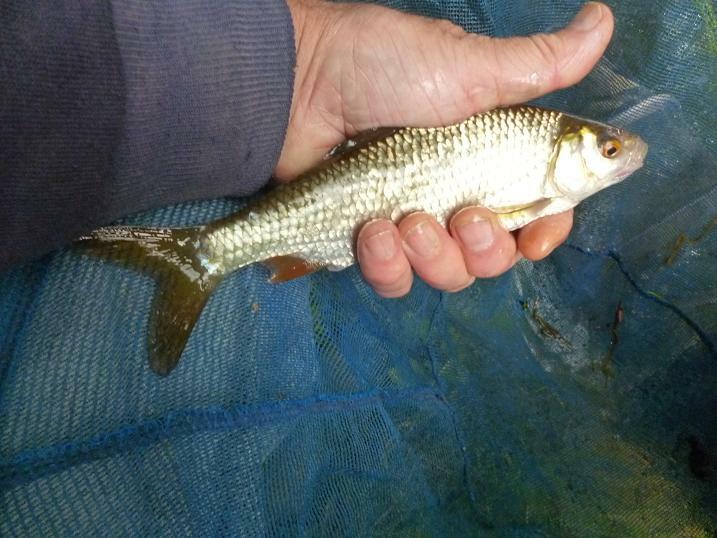 This was the first of many rudd that grabbed the maggots as they fell through, some needing the net to lift them out, the occasional roach and very small chub, also joining the party. It was now a fish a chuck. Swing the float in, check it’s progress and strike as the float sank away. A different solid rushing fight put a bend in the rod, and a small perch was now being swung to hand, the first of several. These were the first perch I’ve taken here, having only fished bread, but they were all welcome, fighting well above their weight. The shallow, but coloured flash flood water gave no clues, but there must have been hundreds of fish down there, only visible, when the rod bent into another one. 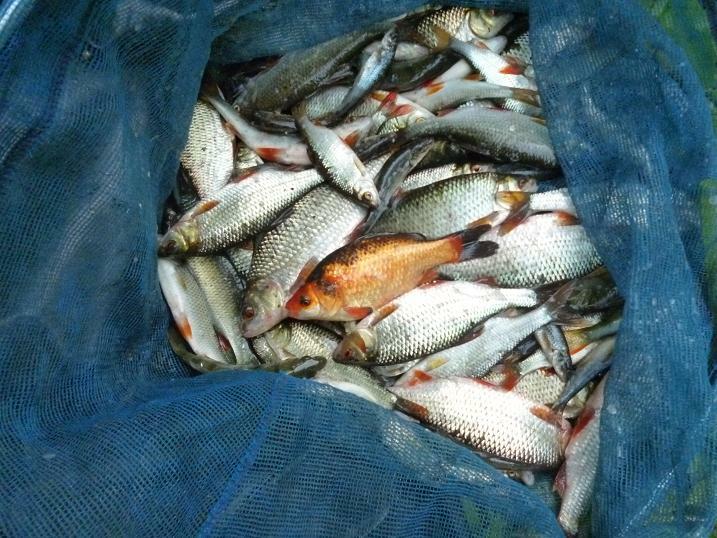 The roach started to come on strong, some now spewing mud and hemp, when I unhooked them. 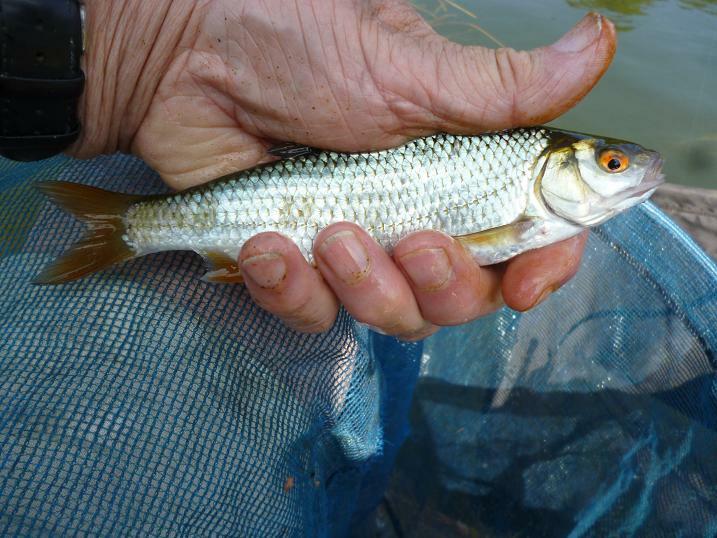 For a bit of river that had obviously not been fished this year, the roach had soon cottoned onto the hemp and I kicked myself for not keeping my leftover tares, which would have selected the bigger roach, although I wasn’t doing bad on the maggot. An elder tree overhung where I sat and a trot through with a berry gave a plunging bite that produced another perfect roach. They really took the berries, but the bites were missable, so I returned to the maggot, which gave a steadier bite, although the fish in the end could not be determined, until struck. One sideways take got me confused, as the fish bored deep and rushed off down stream, needing rapid backwinding to avoid a likely break. It turned and ran right in to my feet, then popped up on the surface. 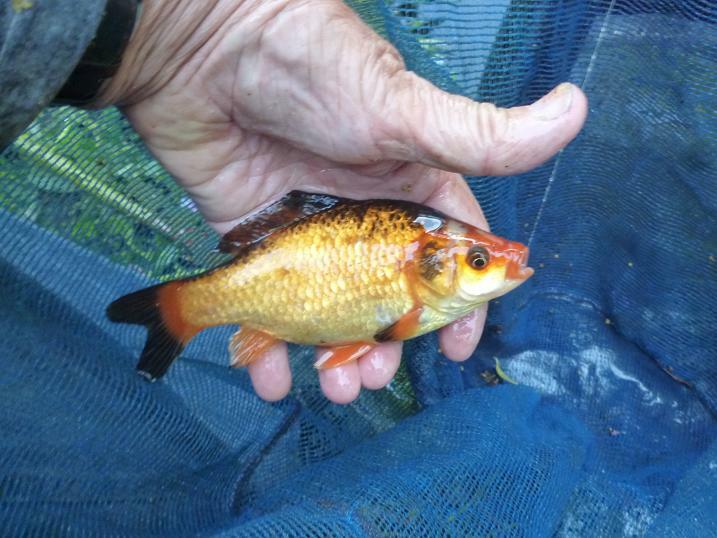 It was a case of shock horror, when I slipped the net under this barrel shaped gold fish. I’m used to seeing them cruising around my pond at home, not charging about the river like a little bully boy. Maybe washed out during the winter floods, or released when it got too large for a tank, it certainly was the surprise of the day. With roach of this quality on tap, it was difficult to call a halt and I fished over my intended 3 hours by another 30 minutes, that “just one more fish” feeling, taking me back to my childhood days fishing with my dad. A quick weigh-in saw the scales bounce round to 11lb, a fanastic haul of previously uncaught fish and I still had some bait left to feed in, when I packed up. The float never got the chance to test out the river beneath the trees, or in the bay. Maybe a visit with some bigger baits next time? 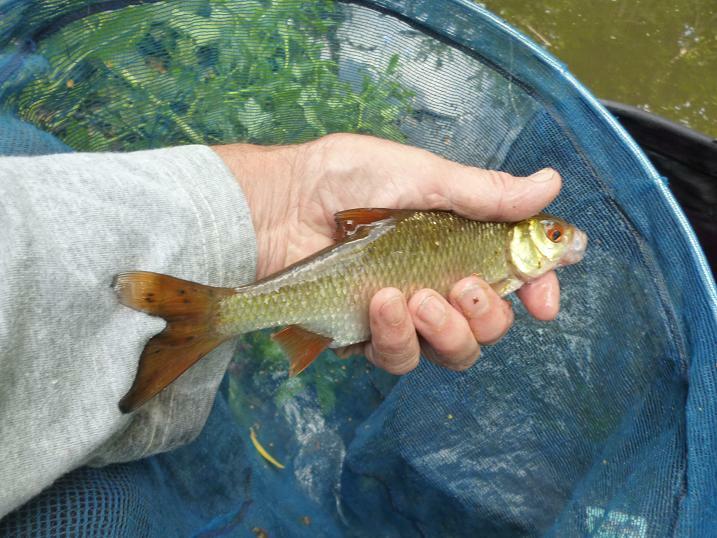 Thames roach, better late than never on hemp and tares. 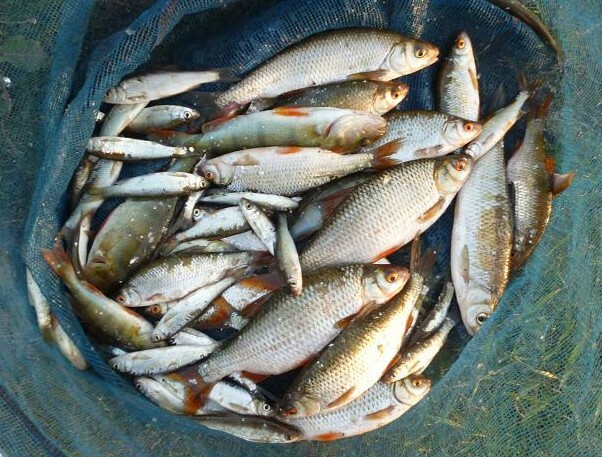 Continued high temperatures drew me to the banks of the Thames at Windsor this week, with the hope of a decent net of roach on hemp and tares, following reports that the day ticket water at Home Park was responding well to these seed baits. 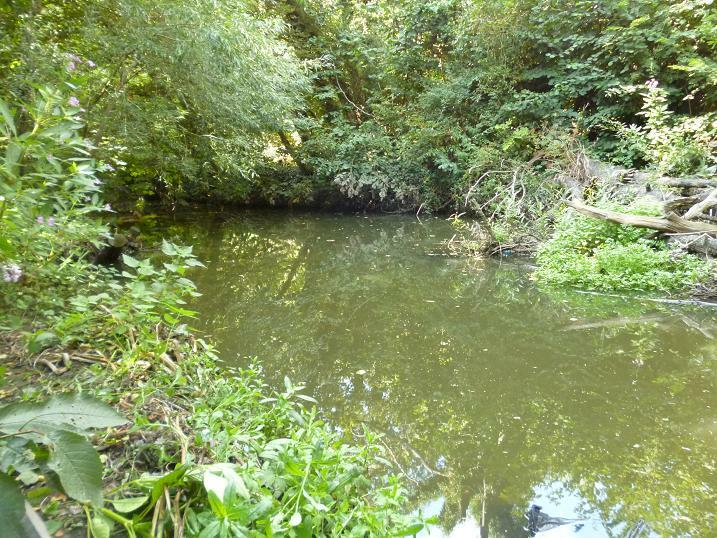 Memories of school holidays spent on this very stretch, shoulder to shoulder with my friends, pulling out roach and dace, as the fish flashed through the water chasing the hempseed, will never be forgotten, or repeated; the Thames of those days being very coloured and highly polluted, but full of coarse fish, eager to grab our bait. Today the Thames runs clear for most of the year and the Environment Agency have figures to prove that it is in better condition, but try convincing the old timers that it is so and you will see their eyes glaze over, hearing tales of catches past. As I made my way down to the far end of the water by the road bridge, I met young Vince, who was busy creating his own memories of sunny days on the Thames. Having set out his stall on the shallows, he proceeded to net a quality roach on his pole line, making it all look too easy. Baiting with tares over a bed of hemp, the modern day matchman gave me a lesson on how it should be done, his light weight, but expensive pole and finely balanced terminal tackle, giving him perfect presentation of the bait and the best chance of hooking a fish. Arriving at my chosen spot, the idea of trotting a stick float down the swim, was defeated by thoughts of Vince and how well the pole had presented the bait in the deeper water. Setting up the pole with a 6 No 4 ali stemmed, bodied stick float, I plumbed the depth and found the river bed shelving away to about seven feet at nine to ten metres, well within range, but a two handed affair with my twenty year old pole. 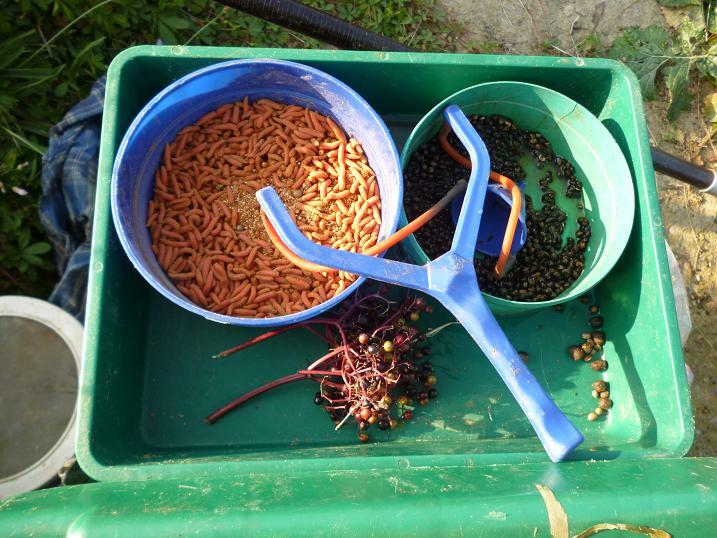 Clipping a bait dropper to the line, I repeatedly filled it with hempseed and dropped a path of the seeds along the nine metre line, adding a few tares for good measure, before trying a tare on the hook. The float dived the first trot and held. I lifted straight up and felt a slight rattle on the end of the line. A tiny dace of a few inches had taken the 6mm dia tare. From a bite like that, I was prepared for the thumping fight of a good roach. 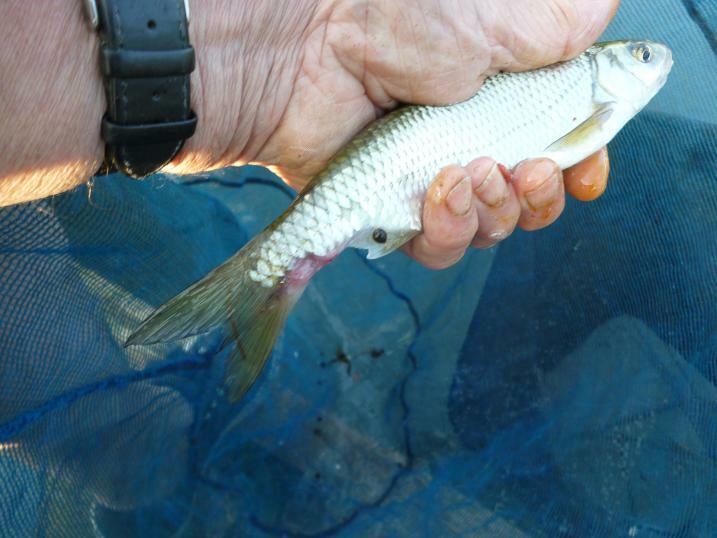 Over the next ten minutes, such bites were missed, or more small dace and bleak were brought to the surface. Still feeding a pouch of hemp each cast, I tried double maggot on the hook. This time a couple of dips of the float and it sank away. The strike pulled out the elastic. A good fish? No, a small perch fighting for all it was worth. Another trot, another perch. At least these gave a good account of themselves. More followed to a half pound, needing the net. Each time I put on a tare, or elderberry, another good hemp hook bait, I would get dips and dives from bleak and small dace. Bringing a small bleak to the surface, there was swirl and the elastic came out again, boring deep. 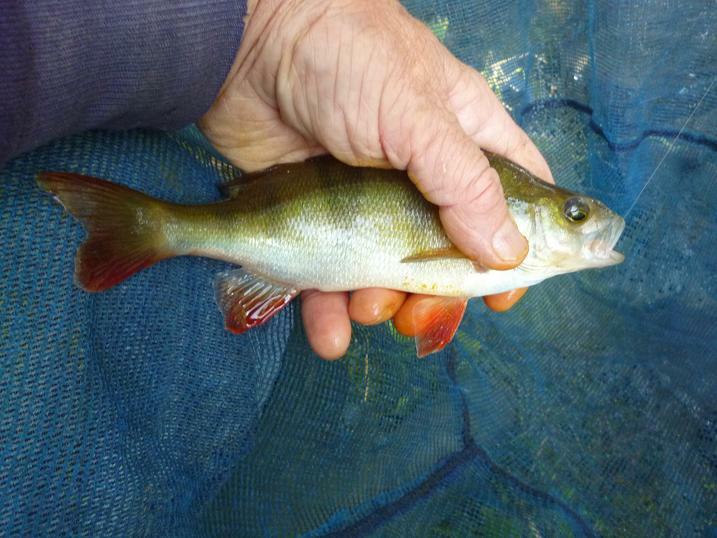 A large perch had seized the bleak, hooking itself and now running hard, parallel to the bank. Too late, I saw where it was heading, a submerged shopping trolley. It swam in and out again, leaving my hook among the caging. I rang the changes with the hook bait, swapping between tare, elderberry, maggot and even hemp seed it’self, but apart from the occasional small perch, small bleak and dace lined up to get on the hook. 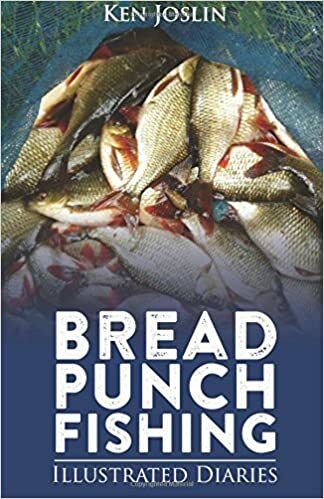 I’d continued bait dropping hemp, with a spray of seed upstream of the swim and two hours into the session the float held down and the distinctive bounce of a roach pulled out the pole elastic to absorb the shock. 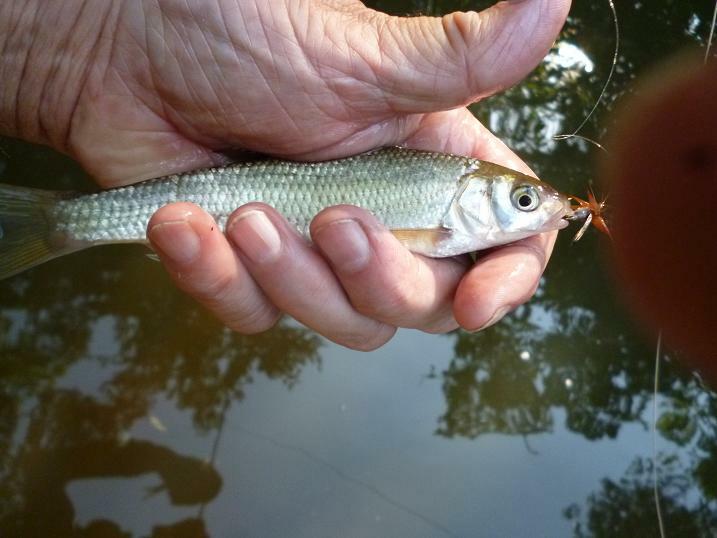 Only a four ounce roach, but the landing net went out anyway and the first of my target fish on a tare was finally in the keepnet. It was 4 pm. 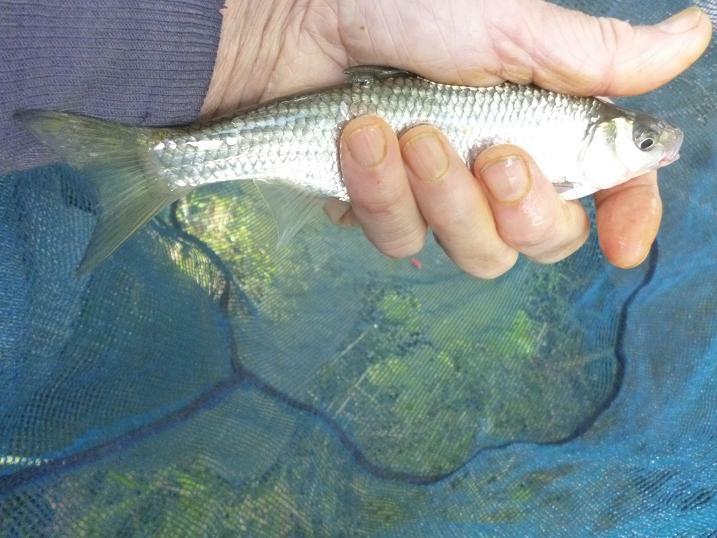 The small dace were still queuing up, but once again a slow solid bite and this time the elastic came out and stayed there, the flash of a larger roach, deep beneath the surface, giving plenty of warning to get the net ready, as I passed the pole back behind me and reduced it’s length to seven metres. At last a better roach, this time on an elderberry. The bright sunshine and heat of the day was now gone and it seemed that a good bag was on the cards. I had intended to pack up at 5 pm, but a call to my wife was now needed to advise her of a late arrival home. A couple more roach, then the solid rolling fight of a big dace kept the elastic out. As I began bringing it towards the surface, the line went solid, and the pole bent into the weight of a pike that had grabbed the dace. All I could do was follow the pike around with the pole, but when the pike tried to turn the dace to swallow it, the line came free and the dace skittered to the surface, followed by the pike, lifting the damaged fish clear, just in time. 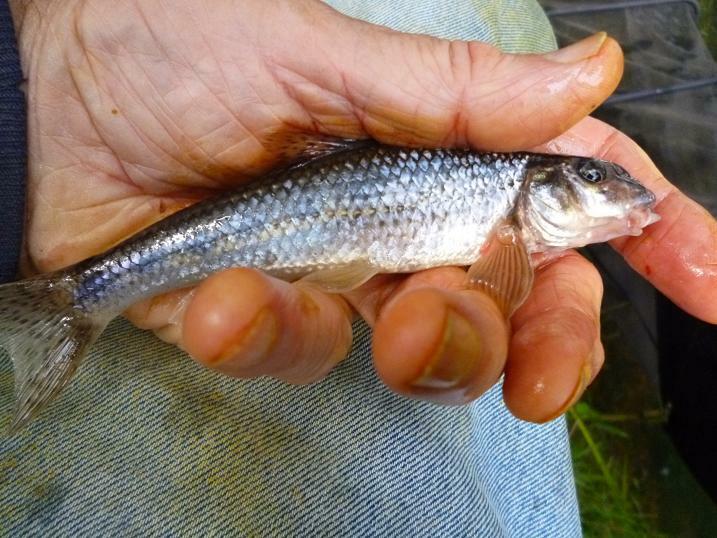 Another big dace, this time grabbed from behind, possibly that large perch, lost earlier. I’d already had one snatched from the line and another with the pike on and a broken hook link. 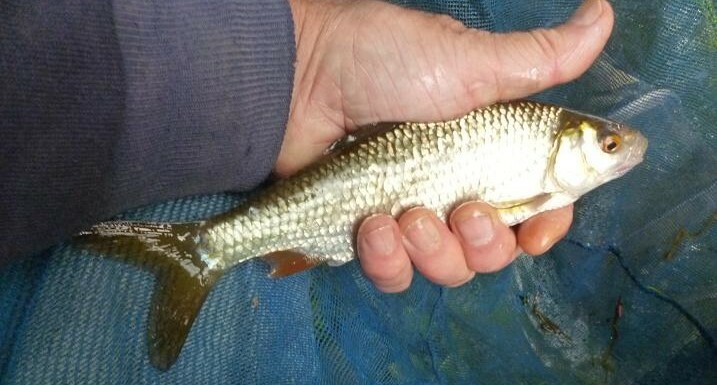 It was only big dace though and I continued to catch small ones and roach without trouble. This was my last roach of the five hour session, my decision to pack up coming from a large barge rushing downstream for a late appointment, that sucked the water from my swim in passing, dragging the keepnet clear of the water, to leave the fish thrashing, only to be tumbled over again from the back wash. a hazard on the Thames that seems to be increasing. I was sorry to see that many of my pristine roach had lost scales, due to the constant passing of boats at speed and the best, that I could do was to return them, after a quick photo.